All vehicles made after 1996 come standard with on-board diagnostics (OBD) systems that serve a number of functions. First, they monitor the engine’s exhaust emissions to help ensure it’s running cleanly and efficiently. OBD systems also use sensors to monitor a variety of engine components for proper operation. 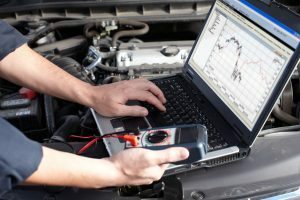 When it detects a problem, the OBD system notifies the engine control unit (ECU), the computer in charge of your engine’s air/fuel mixture, timing, emissions, and other functions. Depending on the type and severity of the problem, the ECU might adjust the engine to compensate or trigger the “check engine” light to let you know there’s an issue. Action Gator Tire is South and Central Florida’s premier auto repair shop specializing in OBD engine diagnostics and repairs. We have the cutting-edge equipment and expert know-how needed to identify your car’s engine problem and fix any issue accurately, quickly, and affordably. Our ASE-certified mechanics will plug our computers directly into your ODB system, evaluate the fault code or codes, and advise you of the problem and all of your repair options. We’ll take all of the guesswork and anxiety out of the process and have you back on the road fast. The most common issue that could trigger your check engine light is a faulty oxygen (O2) sensor. These are routine repairs made to a fairly inexpensive sensor that monitors the amount of oxygen in your car’s exhaust pipes. When working properly, your O2 sensor tells your engine’s ECU how your engine is running, but they wear out over time. A bad O2 sensor will cause your ECU to assume your engine is running very poorly, so it will adjust your engine management parameters and seriously hurt your fuel economy. This means you could lose up to 40% of your gas mileage. Usually, simply replacing the O2 sensor will clear the fault code from your OBD computer and cause your check engine light to turn off. Many drivers don’t realize that modern cars have a sensor that monitors their gas caps. All it takes is a gas cap to be a little loose, and your check engine light might come on. The first thing you should do when you see a check engine light flashing is check your gas cap to make sure it’s tightened properly. In rare cases, your gas cap itself could be damaged or faulty and need replacing, but these are simple, easy, affordable repairs that should turn off your check engine light. All vehicles on the road today have catalytic converters in their exhaust systems, built directly into the exhaust pipes. Their job is to filter and scrub the exhaust air to keep the most harmful substances from exiting into the atmosphere, ensuring cleaner emissions and less harm to the environment. Over time, catalytic converters get dirty and clogged, especially if you don’t keep fresh spark plugs in your engine. Bad catalytic converters are a major cause of check engine lights, but Action Gator Tire is here to handle your OEM catalytic converter replacement needs. Your car’s mass airflow sensor (MAF) is in charge of monitoring the amount of air entering the engine to tell your engine’s ECU how much fuel is needed for just the right mixture. When these sensor stop working properly, it will harm your fuel economy and potentially damage your spark plugs, O2 sensors, and catalytic converters. If you have a bad MAF sensor, the Action Gator Tire team is your source for fast, affordable repair to get that check engine light turned off. Your engine’s spark plugs ignite the fuel/air mixture inside of each cylinder, making them a key component. Spark plugs are powered by your engine’s ignition coils, which send an electrical signal down your spark plug wires to cause sparks at every precise intervals. As these parts wear out, you’ll begin to experience poor performance, reduced fuel economy, and even misfires. Check engine lights can be triggered by faults with spark plugs, wires, or ignition coils, so it’s important to bring your car to your local Action Gator Tire as soon as you see that flashing light on your dash. Engine thermostats have the important and demanding job of regulating your engine’s cooling system to keep it operating at the right temperature without overheating. If your thermostat is faulty or failing to work properly, it could cause your check engine light to flash. You may also notice your engine running hot, especially while sitting still at traffic lights or in parking lots. If this is the case, you’ll need a quick, professional, and affordable thermostat replacement from the Action Gator Tire team. Many modern vehicles have an exhaust gas recirculation (EGR) system that sends some exhaust gasses back into the engine’s intake to help reduce emissions. As with any exhaust component, EGR valves and ports can get dirty with buildup and start to fail over time. When this happens, your car won’t run as cleanly, your fuel economy will be affected, and it could start running roughly as well. Flashing check engine lights could mean a problem with your EGR system, so bring your car to Action Gator Tire as soon as possible when your check engine light comes on. Clogged or faulty fuel injectors, caused by low-grade gas, avoiding fuel filter replacement, and driving frequently with very low fuel levels, can trigger your check engine light. These problems are more common in high-heat regions, like our area here in Central and South Florida. The Action Gator Tire team is experienced and skilled at cleaning and replacing fuel injectors, so it’s a repair we can handle with ease. 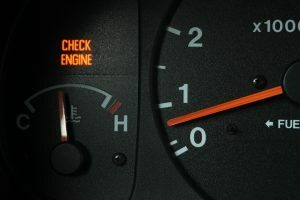 What Should You Do When Your Check Engine Light Flashes? If you see your car’s check engine light flashing or staying lit, it’s important to act quickly. In many cases, you may not notice any big issues with the way your car runs or drives, but check engine lights almost never light up by accident. Continuing to drive with your check engine light flashing may seriously harm your fuel economy or even lead to much larger issues in the future, so don’t delay. As soon as your check engine light comes on, try restarting your car, and be sure to check your gas cap is tightened properly. If it stays on, bring your car straight to your nearest Action Gator Tire location for fast, accurate diagnostics and trustworthy service. Why Choose Action Gator Tire for Your OBD Engine Diagnostics & Repairs? There is no shortage of auto repair shops in the Orlando, Ft. Lauderdale, Sarasota, Tampa, and Ocala, Florida areas. How do you know who to trust? At Action Gator Tire, we make it easy to know you’ve made the right choice. When you bring your car to use for OBD engine diagnostics and check engine light repairs, we’ll start building your trust immediately. Our friendly expert mechanics will be honest and up-front with you at all times. Our clean, modern shops are welcoming, comfortable, and equipped with excellent customer amenities. We’ll put you at ease, educate you about your vehicle, and help you understand how best to use your budget. You’ll leave with a properly running car and an unmatched level of confidence that Action Gator is your trusted local mechanic.